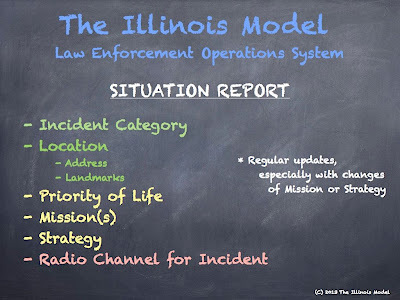 Over the past few weeks, I have been re-engineering Police Incident Command according to The Illinois Model law enforcement operations system (LEOpSys). Most of the ideas aren't earth-shattering, but they suggest some small adjustments to the nationally-mandated program. The first several posts lay some foundation into our vision of what IC should be. This is the fifth and final installment. Click on the Incident Command label for all posts in this 5-part series. Incident Command is not about dry-marker boards. It's not about comfy mobile command posts. Or organizational charts. It's not about pocket cards or checklists either. Incident Command is a balance between leadership and management while problem-solving in the face of crisis. It brings together problem analysis, goal-setting, and hasty planning. And we believe The Illinois Model LEOpSys is the answer. Officers cite the SitRep section as the most useful on our pocket cards. This has nothing to do with mobilizing command posts, detouring traffic, identifying resources, or even setting perimeters. In many cases, this seminal process can be completed in literally seconds, if not quicker. For example, when an attacker ambushes an officer, the process is immediate! But conversely, in cases of pre-planned operations (like a warrant service or dignitary protection detail), the plotting through these three steps can take minutes or longer. It's these steps that drive the entire police response. At the onset, we establish the Priority of Life . What is the problem? Is it a simple traffic violation? Is it an active shooter? Is it a well-being check? Is it a wanted person who is to be arrested? Who is in danger? Is it an innocent person? A suicidal person? A police officer? The community as a whole? A dignitary? What is the threat? Armed offender? Medical emergency? Maybe a low threat? This is where officers analyze the situation. Some police problems are life-threatening. Others just simply....aren't that big of a deal. 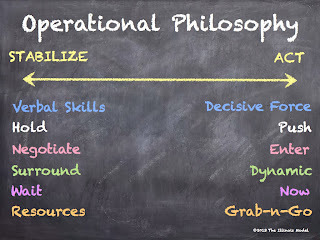 Only after figuring out the problems can we even begin to determine a Mission-Objective or solution to each of them. Officers must figure out what objectives to reach first. In the case of an active shooter, the active gunman MUST be stopped before medical aid is given to those already injured. That scenario is the epitome of prioritizing multiple problems and solutions! Some police problems have a solution that involves searching or going into a dangerous area. Some involve arresting or detaining a person. This is where Search & Seizure issues arise. Officers must have a lawful foundation to act...which requires a lawful objective. Objectives must be lawful to be considered. For quickly unfolding situations, officers must be acting within the exceptions to warrant for search and/or arrest. Again, when looking at an ambush on an officer, the lawful solutions are to stay alive, stop the offender, and arrest the offender. Once resolutions or goals are determined, then a plan or Strategy-Tactics can be addressed. A big part of planning is weighing the "intrusiveness" of police officers. Intrusiveness is oftentimes measured by the force, speed, intimidation, attitude, or aggressiveness of officers. 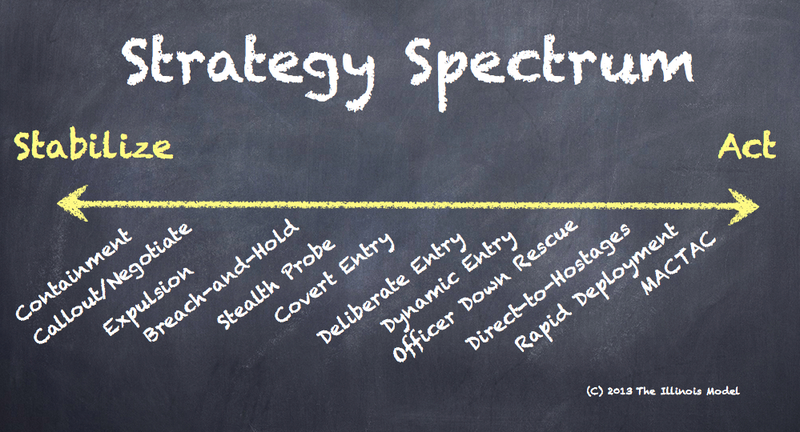 A general spectrum that officers can adopt. 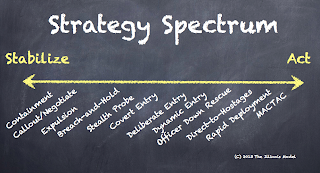 "Bookends" of several aspects of police strategy. In all cases, officers responding to any incident should know whether the plan is to Stabilize or Act, or how intrusive or forceful to be. With training and tabletop scenario practice, oftentimes a strategy or plan is already decided, agreed upon, and understood. The process used during training is the same as policy. Which is the same as a decision-making process. Which is the same as the internal investigation, debrief, and explanation. The Illinois Model's singular process answers both questions How? and Why? in a logical method -- that can be understood by officers, juries, judges, and the general public. 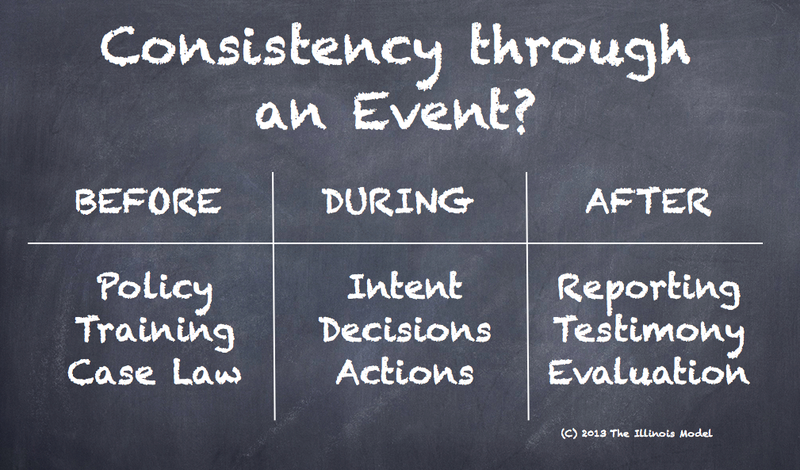 It makes for solid usable policy and as a template for conveying the reasoning and justification after an event. It's quite applicable. 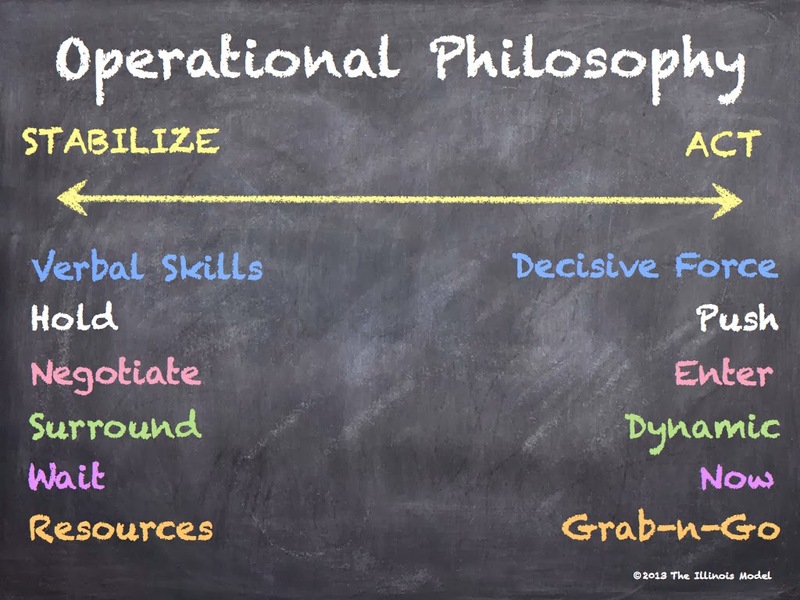 And when officers are trained and experienced in using the process, they become Tactical Philosophers. They make decisions based on higher-order justifications based on threats and the situation. They determine lawfulness. They make community-accepted and court-defensible plans to reach those goals and resolutions. They balance force and intrusion against freedoms and rights....and can explain it all. 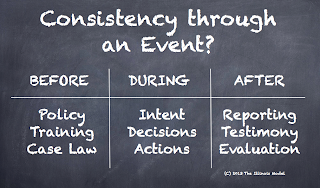 The SitRep framework announces the most critical aspects of an incident. The SitRep is a both a communication tool and a decision-making tool. 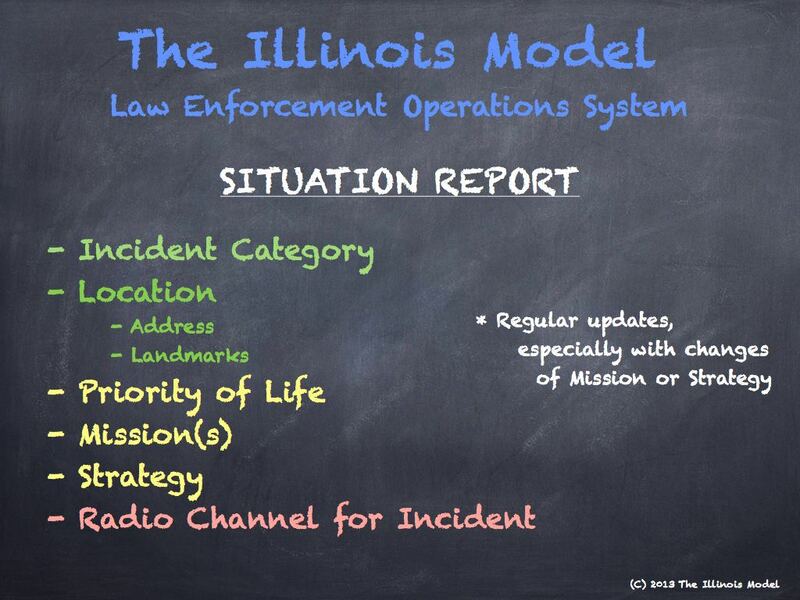 As a communication tool, it briefs or updates responding officers of the big picture. And the big picture is more than knowing where perimeter officers are posted (management) ----- it begins with the fact that officers should even be setting a perimeter at all (leadership). If officers should be making an emergency entry into a danger area, the perfectly orchestrated containment or traffic control is absolutely wasted!! More important than assigning officers to a rescue team is first figuring out if a rescue is necessary. And before a textbook building search can be put into play, officers must determine that their entry is lawful or part of the bigger strategy. It's the difference between the sports coach and the chessplayer. Police Incident Command needs a system that is built on leadership BEFORE management. But still both. It's been my fear of NIMS/ICS that these foundational aspects of problem analysis, goal-setting, and planning/strategizing are overshadowed by the bureaucracy of checklists, binder-thick crisis plans, and a white-board mentality. These things have their place in the management of an incident....once things slow down and begin to stabilize. But they are not effective or efficient tools or skills in those first seconds and minutes of a police response. Incident Command, at it's root, MUST be about problem-solving in the initial stages of crisis, danger, and uncertainty. It's about coordination, teamwork, and communication. It's about applicability, scalability, and adaptability. It's about leading people together toward a solution...with nothing more than a portable radio and a pocket notebook. We cannot lose sight over these simple concepts and principles. That's the big picture. Louis Hayes is a co-developer of The Illinois Model™ law enforcement operations system (LEOpSys) and moderates several courses rooted in its theory and concepts. He is a 15-year police officer, currently assigned to a multi-agency tactical unit in Chicagoland. He strongly believes in one of the Model's main themes: explain an issue by beginning with broad concept and principle, then filter down towards details and techniques. A full compilation of articles on The Illinois Model can be found here.